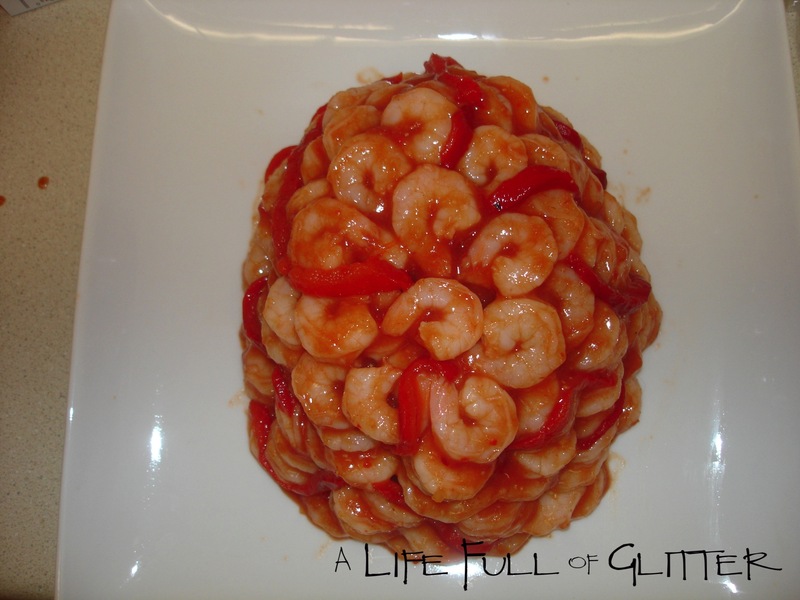 This Halloween Shrimp Brain is so much fun! Looks so gross as well. LOL Very simple to make only 5 ingredients. I made this one a few years ago and stubbled across my picture and just had to post before Halloween! Make sure shrimp are thawed out. 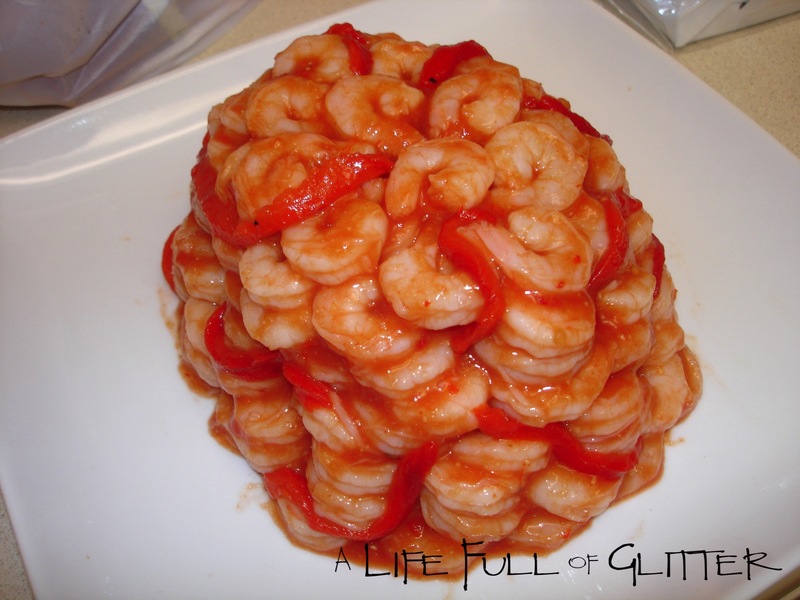 There are two ways of making this Shrimp Brain, in a Brain Jello Mold or you can free hand mold. Begin arranging roasted sweet peppers around the mold forming “blood vessels”. Then arrange shrimp, tails toward the center, in a circle around the bottom of the mold. Repeat layers until the mold is full, pressing down every couple of layers. Place in fridge until sauce is ready. In a small saucepan combine chicken broth and unflavored gelatin; let stand for 5 minutes. Cook and stir over medium heat until gelatin has dissolved. Pour in 1 bottle of cocktail sauce and mix together. Remove mold out of fridge and pour mixture over shrimp. Cover and place back in fridge for at least 5 hours or overnight. To unmold, set bowl in a sink filled with warm water for several seconds. Place a plate over the mold and turn over. Cover and chill until needed. In a small saucepan combine chicken broth and unflavored gelatin; let stand for 5 minutes. Cook and stir over medium heat until gelatin has dissolved. Pour in 1 bottle of cocktail sauce and mix together. In a large bowl combine shrimp and cocktail mixture together. On a plate start arranging shrimp tails toward the center. 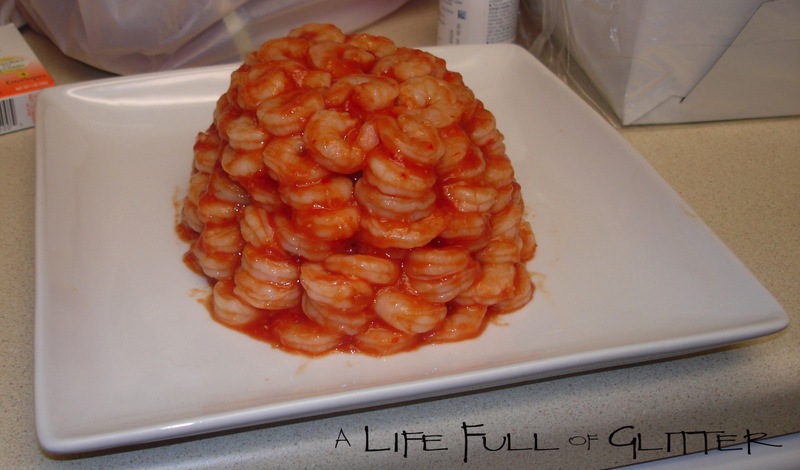 Start stacking shrimp on top of each other making a dome shape. Place sweet red peppers around the top of the brain to make “blood vessels”. Pour any left over mixture over the brain (you may not need all of the mixture). Cover tightly around brain with Saran Wrap. Place in fridge for at least 5 hours or overnight.